Eid Al-Adha is a celebration that brings happiness and joy to many communities across the Muslim world. It is also known as the Feast of the Sacrifice or the Greater Eid and celebrates the moment when Allah appeared to Ibrahim in a dream and asked him to sacrifice his son, Ishmael, as a sign of his faith. On the first day of Eid, friends and family gather together to exchange gifts (often new clothes are given) and share food, like the delicious Ma’moul depicted above. While Eid Al-Adha is a time of celebration, it is hard not to think of the many Syrians who will not be able to enjoy the spirit of Eid this August. The number of newly displaced people in Syria’s north west is over a million, and their needs are great, particularly in relation to health care. During the past few months, with your contributions and those of other generous friends, Hands Up has been able to make a difference to the lives of over 3,000 Syrians in rural Aleppo who are in need of basic medical care from Pediatric to Orthopedic matters, as well as Emergency consultations. We are determined to continue this vital work to support those in need. 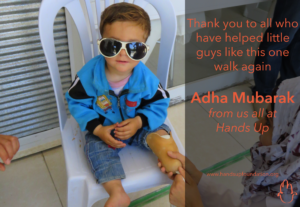 From all of us here at Hands Up, thank you for considering donating any amount that could aid a Syrian family in need, especially during Eid Al-Adha, which is after all, founded on compassion and generosity. Whatever you decide to give, we wish you a very happy Eid Al-Adha.